For many years author and UMD English Professor Joseph Maiolo has brightened the holiday season with his annual reading of Truman Capote's "A Christmas Memory." 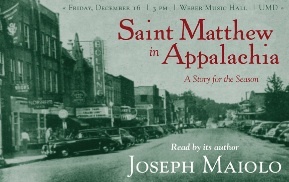 Begin the winter holidays this year with a new tradition of Maiolo reading one of his short stories, "Saint Matthew In Appalachia," on Friday, December 16 at 3 p.m. in the Weber Music Hall at UMD. The setting of the story begins when World War II has just ended. The fictional Virginia town where the main protagonist lives is similar to Norton, Virginia, where Maiolo was raised. The cast of characters is a group of residents in the town, local friends and complete strangers. A young boy is the narrator, and he lives with his Italian grandmother in an apartment above a store on Main Street. Her character is based on Maiolo's own grandmother, and while the story is fiction, Maiolo admits that, "it is close to the bone." This event is free and open to the public with a reception after the reading.